Lee’s debut novel, a quirky if formulaic take on bullying and friendship, falls short in its description of the partnership between Benji, the narrator, and Elvis, his talking service dog. Benji Barnsworth suffers from a host of ailments and faints under stress—which happens often, since he’s Billy Thompson’s favorite bullying target. When Benji has a seizure, he trades his new helmet for a service dog: a huge Newfoundland with a smart mouth. 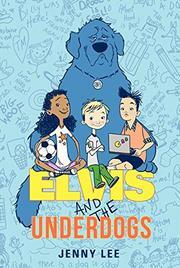 Elvis isn’t exactly man’s best friend, but his presence allows Benji to befriend Taisy, an overwhelmed athlete with an ex–football pro father, and Alexander, a “human GPS” with a photographic memory. Benji’s witty, slightly cynical voice and close family support are the most believable aspects of an otherwise implausible book. His friends are caring but stereotypical; Asian-American Alexander’s intellect borders on caricature, and Taisy’s relationship with her father follows sitcom formula. The service-dog aspect reads like an afterthought. Even Benji’s doctor uses “service dog” and “therapy dog” interchangeably despite their different functions, and Benji is unable to say what training Elvis received, which seems remarkably incurious, given their relationship. Elvis’ job is so unclear that he could just as easily be an ordinary dog dispensing tough love.